VOICES CO. IS NEW ZEALAND’S FIRST AND ONLY CONTEMPORARY A CAPPELLA ACADEMY. WE ARE PASSIONATE ABOUT HELPING EVERY PERSON FIND THEIR VOICE - STARTING WITH YOU! 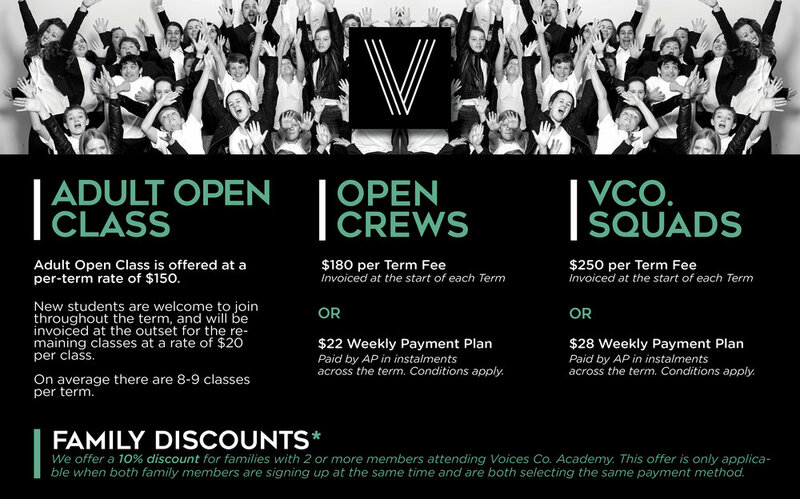 Based in Christchurch NZ, VOICES CO. is the country's first Academy to specialise in contemporary a cappella singing! Voices Co. Academy offers a whole range of vocal training, from private singing lessons through to our signature ‘aca-pop’ ensembles! Inspired by music like Pentatonix, the Pitch Perfect movies, and NZ's rich choral tradition, at Voices Co. we are passionate about seeing singers of all ages equipped with the very best in vocal training, encouraged in their passion for music, and empowered to find their voice. Whether you’re a beginner vocalist or a professional performer, we have something for all ages and stages, and we would love to hear from YOU - just click on the button below to get in touch so we can help you find the perfect fit! Please note, this is the email that will be used for Academy invoices and updates relating to you/your child. Please note, this is the mobile number that will be used for contact relating to you/your child. If under the age of 18. I confirm that I have permission from my parent or primary caregiver to participate in Voices Co. Contemporary A Cappella Academy. If relevant, please note any music / vocal / choral experience your child has had. If relevant, please note any singing or musical experience you/your child has had. We have a range of open classes (Crews) and auditioned ensembles (Squads) on offer, and we aim to deliver a robust programme that caters to all ages, skills and levels of experience. Please note below which area you think you'd be most interested in focusing on, and we'll be able to discuss the best fit to help you get there! If a friend referred you to Voices Co. please note their name below. I don't want to be kept in the loop. Thanks for taking the time to register for Voices Co. Academy - we'll get back you within the next week using the details you've provided! If you're new to singing and want an opportunity to learn the foundations needed to access and ENJOY your voice then this fun, relaxed approach to singing tuition could be perfect! We are passionate about offering every person the chance to find their voice - it's your very own instrument, personal to you, and we want YOU to have the freedom and knowledge to use it to your heart's content. Adult Open Class focuses on the fundamentals of using your voice, offering training on breath technique, range, vocal health, tuning, basic theory, how to follow along with written music, and the number 1 skill for singing: CONFIDENCE! We work at a pace that suits the class as a whole, and we do offer the option to participate in our Academy Shows (July/Dec) for those that feel up to the challenge! The 6 month programme is designed to function as both a group vocal lesson, as well as an introduction to singing in harmony, and is a 'feeder' into our Adult Crew. Crews are our non-auditioned a cappella training ensembles, and are the perfect space for singers to build confidence and just have a go! Our Crew classes are aimed at nurturing a love of music and harmony, as well as offering the highest quality vocal training, all in an level-appropriate format. In our weekly classes we introduce students to the basic elements of ensemble singing and contemporary a cappella harmony, such as vocal technique, score reading, tuning, teamwork and confidence - all while singing some seriously great music fresh off the radio!!! Our Squads are curated ensembles of auditioned vocalists, often with only 1 or 2 voices per part, and are for singers with a bit more experience. Building on the skills developed in our Crews, the main focus for a Squad is on preparing music to a professional level. Squads train weekly, with additional rehearsals ahead of a performance. As well as showcasing their work in our Academy Shows (June/Dec), our Squads are often invited to perform at community events around the city. In 2017 our Youth Squad toured with Ali Harper, our Adult Squad performed at the Christmas For The City festival, and our Performance Squad were crowned the winners of TVNZ's reality a cappella competition 'The Naked Choir' taking the title of 'NZ's Best A Cappella Group'! Brand new for 2019 we are so excited to be launching a range of pop a cappella classes especially for the littlest human’s in your life! Our Beat Boppers programme offers fun, interactive vocal classes for 3-6 year olds, in a short, action-packed format! Each Beat Boppers class is just 25 minutes long, and is filled with pint-sized versions of all the cool elements of pop a cappella - including singing, harmony, rhythm, body percussion, and even a bit of beat boxing! While these classes are short, they are specifically set up to help your little one’s mind engage with music in an age-appropriate format. Each session helps to develop the foundational elements of music, building skills like a strong ear, vocalization, pitch and intonation, rhythm, and harmony, all using a fun and exploratory format that they will love! The 3-4 year olds class requires an adult to participate with each child, but the 5-6 year olds class is an independent one, where students attend on their own! Our passionate and experienced tutors will have your kids humming, singing and exploring their voice before you can say “Pitch Perfect”! Based in Christchurch NZ, VOICES CO. is the country's first Academy to specialise in contemporary a cappella! Inspired by music like Pentatonix, the Pitch Perfect movies, and NZ's rich choral tradition, at Voices Co. we are passionate about seeing singers of all ages EQUIPPED with the very best in vocal training, ENCOURAGED in their passion for music, and EMPOWERED to find their voice. From private tuition and open classes, through to specialist contemporary a cappella ensembles, we have something for singers of all ages and stages! Simply put, the term ‘a cappella’ refers to singing without accompaniment, though the literal translation of the word is actually 'in the style of the chapel'. A cappella harmony itself has been around for centuries and has reinvented itself over and over again! At Voices Co. we train our vocalists in all aspects of contemporary singing and contemporary a cappella, from the more traditional elements such as vocal technique, musicianship, group harmony right through to vocal percussion, performance artistry, and even beatboxing! The addition of more 'contemporary' elements such as beat-boxing and vocal instrumentation has helped reintroduce a cappella singing to pop culture and open up an even broader range of opportunities to those willing to take up the challenge! Voices Co. Academy uses a tiered training approach. We offer three streams of training: Open Classes, non-auditioned Crews, and our professional-level auditioned Squads. Our programme is structured so that we can offer contemporary a cappella and contemporary vocal training to anyone at any level, from beginners right through to experienced professionals. We also love to celebrate the hard work and talent of our students, and a the end of each Semester (July / Dec) we hold an Academy Show featuring all our different ensembles! Stay in the loop with what Voices Co. is up to! We respect your privacy and won't be sending your details to other people willy-nilly! WE KNOW FINANCES CAN BE A CHALLENGE, SO WE'VE GOT A FEW DIFFERENT OPTIONS TO HELP MAKE LIFE EASIER!